OSO — Two of the most pressing questions for planners and policy makers about the Oso landslide are closer to being answered. The deadly slide on March 22, 2014, cast renewed focus on development in rainy, hilly western Washington. It is known that we have landslides that frequently block trains and damage property. But the Oso slide, which killed 43 people and laid waste to part of the Stillaguamish River Valley with its mile-long runout, appeared to be an outlier. The questions then, were, just how much of an outlier was Oso? And by extension, how often do big slides like Oso happen? “For our purposes we want to know if it’s thousands of years or hundreds of years,” said Alison Duvall, an assistant professor of geomorphology at the University of Washington. According to a new paper in Geology, a scientific journal published by the Geological Society of America, the answers to those two questions are (1) not much of an outlier at all, and (2) slides of similar magnitude happen quite often. The upshot is that the Stillaguamish Valley has experienced large, long-runout landslides every few hundred years since the glacial ice sheets receded about 12,000 years ago. The lead writer on the paper was Sean LaHusen, a PhD student in geomorphology at the University of Washington. He was joined by Duvall, David Montgomery, who is a professor of Earth and Space Science at the UW, and Adam Booth, an assistant professor of geology at Portland State University. The paper, titled “Surface roughness dating of long-runout landslides near Oso, Washington (USA), reveal persistent postglacial hillslope instability,” is online now on Geology’s website (geology.gsapubs.org) and is expected to appear in print early in 2016. The authors arrived at their conclusions through a two-step process. The first involved radio-carbon dating, a common method of estimating the age of organic material. Woody debris often contains a small amount of a radioactive isotope of carbon mixed in with the non-radioactive form of the element. Because the radioisotope decays over time, comparing the ratio of radioactive to nonradioactive carbon in an older wood sample to that of a contemporary sample allows scientists to estimate the age of the older samples. At Oso, researchers gathered samples of woody debris from the Headache Creek slide, a smaller feature that lies just northeast of the Oso slide, and the Rowan landslide, which is older and much larger than the Oso slide and stretches from the Oso slide west almost to the Whitman Bridge. Those landslides have long been covered by forest, but lidar imaging, which penetrates tree cover and accurately shows the contours of the land, makes it easier to spot older slide zones. Three wood samples found buried in the Headache Creek slide were found to have approximate ages between 5,757-6,278 years. Six samples of debris from the Rowan slide, however, turned out to be much younger: between 300-694 years old. That dates them before the arrival of the first European explorers in the Northwest. On a geologic time scale, that’s a blink of an eye. Those results helped pinpoint those two landslides in time, but the next step was to figure out the relative ages of other major slides in the valley. “In order to do any risk analysis, one needs a frequency,” Duvall said. “You need to understand the hazards to understand the risk,” LaHusen added. The second step was to use a mathematical model that LaHusen and Booth developed that analyzed the relative roughness of the ground in the slide zones. Landslides deposit their runout in uneven clumps. As seen in Oso, younger slides leave behind broken ground and uneven deposits. Over time they erode into gentler shapes. The model is based on calculating the roughness of the surface of landslides of a known age, such as Oso, and now also Rowan and Headache Creek. That model was then applied to all the other known landslides within a roughly two mile radius of the Oso slide, to estimate their ages. Lidar imaging of the valley has shown that there are 25 deep-seated landslides within that area. Those landslides have occurred on both north and south sides of the valley, and some of them have similarly long runouts, Duvall said. In some places, you can walk from one side of the valley to another entirely on landslide deposits, except when you are wading in the river, she said. Using the mathematical model, the scientists estimate that landslides have occurred in that vicinity at a rate of one every 140 to 500 years. The actual rate is probably closer to 140 years than 500 years, LaHusen said, because some old slides get completely buried under new ones and can’t be measured. “The 2014 Oso landslide was the latest event in an active history of slope failures throughout the Holocene,” the new paper states. The Holocene epoch is the most recent geologic time period, starting with the end of the ice age about 12,000 years ago. It is concurrent with the growth of human civilization. The study is by no means definitive. Duvall and LaHusen said that the mathematical model is more of a means than an end, and it can be used to strategically select targets in other landslides for carbon-dating, which in turn will help put a more precise age to those slides as well as further refine the model. But finding woody debris to make those measurements — usually embedded in long-deposited soils and clays — is a difficult task involving a lot of field work. For example, a wooded knoll on the south side of the valley, informally known as Engineer’s Lookout, is actually part of the runout of an older slide on the south side of the valley, Duvall said. The researchers couldn’t find any samples in that slide. “We tried four times to find wood matter there,” Duvall said. One hypothesis the scientists had going into the study has already been largely disproved: that when the glacial ice sheets receded, there followed a period of active landsliding before the valley settled into the shape it is in today. The most likely model is what the study now supports: continuous sliding of hillsides in the valley throughout human history. “Instead of just falling all at once, they continue up to the present day,” LaHusen said. Duvall and LaHusen hope that their study will provide a new direction for exploration: Using lidar imaging to map landslides, using the mathematical model to estimate slide age and frequency, and then using more expensive carbon-dating at selected sites to more accurately estimate the ages of those slides. That data can be used to determine which landslide zones are the most likely to pose a danger. The first steps in that process are already under way. This year the Legislature approved $4.6 million in funding to kick-start a lidar mapping program for the most slide-prone regions of the state. The state is expected to hire seven new staff members, including four geologists, to do that work, said Joe Smillie, a spokesman for the Department of Natural Resources. 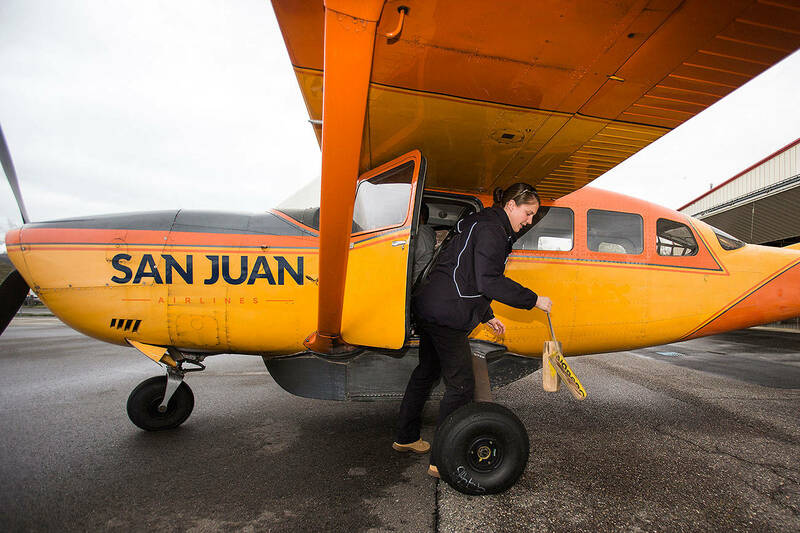 “We’ve tried to get some flights underway, but it’s tough with all the cloud cover,” Smillie said. The state’s plan calls for aerial lidar mapping of 3,023 square miles in the “North Puget lowland” area stretching from Everett to Bellingham, and from Puget Sound into the Cascades. The work would be done in the next two years. The state also plans to map a smaller area in King County and in 2018 will move into southwest Washington. That would go a long way toward scientists’ goals of developing a comprehensive landslide map of the state. “It would be really nice to have lidar for the whole state,” Duvall said.